Today’s feast brings to the end the Christmas cycle: 40 days ago we celebrated the Incarnation on Christmas Day. This feast has another name: the Byzantine Church calls it the Encounter of Our Lord. Western Catholics will call it Candlemas. Why celebrate the Presentation of the Lord in the Temple? What impact does it have for us? 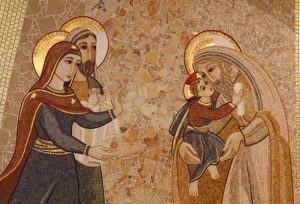 Look to Luke’s Gospel in which we see the honoring of the requirement of the Moasic Law for a mother’s purification forty days after giving birth. She comes to the Temple for prayer and re-incorporation into the community of faith. At this time child birth made the woman unclean to for a period of time. The Church uses the appearance of Joseph and Mary for these rituals to underline the paradox that God, author of the Law, here submits to the Law. It is important to note that St. Luke records this particular observance of the Law. “The Church uses the appearance of Joseph and Mary for these rituals to underline the paradox that God, author of the Law, here submits to the Law.” Also biblically tied into the Temple visit was the recognition of Israel’s first-born sons who, when Egypt, were killed prior to the Exodus event; hence by tradition parents were bound to present an offering to claim their child. Luke also reveals to us the prophetic utterance of Simeon and Anna who recognize and encounter the child Jesus as the glory of Israel, the light of revelation for all people. This encounter realizes the revelation of Jesus as the foretold Messiah — a fulfillment of an expectation.